Book in One Word: Goodtastic! Ah, yet another highly recommended, well spoken of book that everyone said was good and I took forever to read. Why? Because I am an idiot. What other books have I not read that I totally should? Because Grave Mercy? Not only was it better than I thought it would be, and not what I thought it was going to be about, but it was good. And why don't I have time to read Dark Triumph and Mortal Heart yet? I should drop out of college. Grave Mercy is about Ismae, a girl hated by her father and who's saved by a convent when she's forced into a nasty marriage. But this convent is not just any convent--it's the convent of the saint of Death, St. Mortain. The Sisters worship Death and teach other girls the ways of fighting, seduction, poisons, and all manners of killing people. So when Ismae is brought there, she goes from being the sheep to being the wolf. (Or maybe she was really the wolf all along?) And then Ismae is sent on a mission by the Abbess and St. Mortain to the courts of Brittany, where she shall feign being a mistress while trying to discern who's a French spy. And it's pretty freaking excellent. Going into this book, and since I'd heard of it, really, I'd been wary. I haven't read a lot of historical fiction because, well, history classes, except for certain time periods, bore me, and therefore so does history. (Though I have read a wee bit of historical fiction and I think I've really liked it all?) And this book is not the shortest of books. But then there was a readalong and I needed to get more books read--stupid school--so I joined in. And thank gosh I did, because Grave Mercy was so much better than I thought it would be. This book, ladies and gentlemen, whether you like long books or not or historical fictionishness or not, is good. And not only did LaFevers weave so many elements into the book, but she also did them strongly. Ismae, for example, is a character who shows growth and is able to fend for herself; she's a strong heroine. The Duchess of Brittany is, like, twelve, and she's pretty darn good at holding her own, too. Duval is excellent (more character growth, in my opinion), and so are his friends Beast (COOLEST NAME EVER) and de Lornay. And any nasty villains are, well, nasty villains. 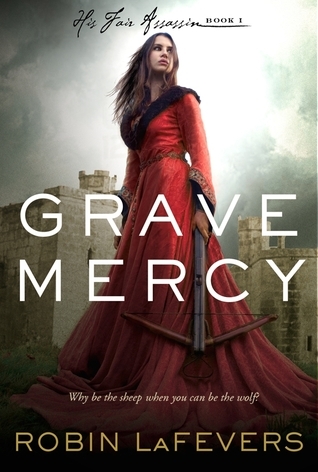 But Grave Mercy has good characters and character development, a good story and plot points, and good writing. So I guess it's a good book too. Did I love it? Very close. Would I purchase it? Fortunately, I bought this when Robin LaFevers was coming here for a signing, so I already have it. Who would I recommend it to? How about everyone? If you like historical fiction or fantasy or assassins then you should totally read this. Also, you might like it if you like it when shady things are afoot in the land of the royals.